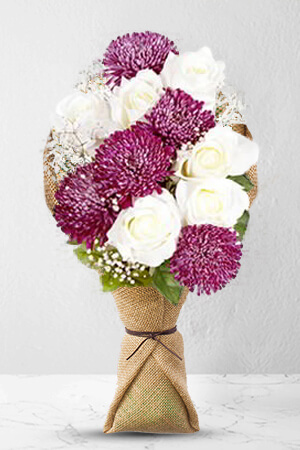 This simple yet elegant bouquet is everything its name suggests - Charming. 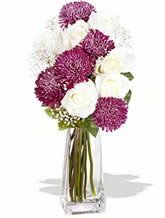 Prepared using gorgeous premium Roses and unique Disbud Chrysanthemums, this is sure to charm the pants of that special someone!Vase not included however; as an ideal match for Charming, we recommend including a Standard Vase to your order. I called my mum and she said her flowers were absolutely gorgeous Then she sent me a photo I'm really pleased they made her day. Delighted with the professional service. Delivered as requested and the flowers were absolutely stunning. Lovely flowers but not at all like the picture chosen. I had lost track of the date and was thrilled to receive a call from my good friend. The flowers which I had ordered for her birthday had arrived and she was thrilled. "What a lovely surprise! They are a beautiful red colour. Thank you so much for remembering my birthday". And thank you zFlowers.com for the reminder and making it so easy to reorder!